What an evening! We were sitting on the edge of our seats as Genevieve Taylor and Andy Clarke were announcing the winners of this year’s Bristol Good Food Awards – Local Producers. The list is out for the Bristol Good Food Awards 2018 and we’re are absolutely over the moon to be featured in two categories this year: Best Preserves and Best Oils & Sauces. We’re up against some worthy opponents as always with the food scene in Bristol – cross your fingers and toes for us on Sunday 25 February 2018! We’re delighted to announce that you can buy and ship our products to Europe! All countries are covered. Simply shop as usual, and when you get to the check out select the country you wish to ship, click on update shipping and continue as usual. Posting and packaging starts at £13.45 for 1-3 jars or sauces! We’re delighted to have been shortlisted finalists for the very first Crumbs Magazine Awards in the Food Producer category. Winners to be announced on 1 October! The awards have been created to celebrate the awesome food scene Crumbs Magazine have here on their patch, and recognise the people and businesses behind it. The winners’ trophies are going to be hotly contested, with businesses large and small from across Bath, Bristol and the surrounding areas all getting in on the action, hoping to be named the best in the local industry. Using Tilapia fish that have been sustainably farmed in a shipping container by Bristol Temple Meads train station, this limited release is one to savour. 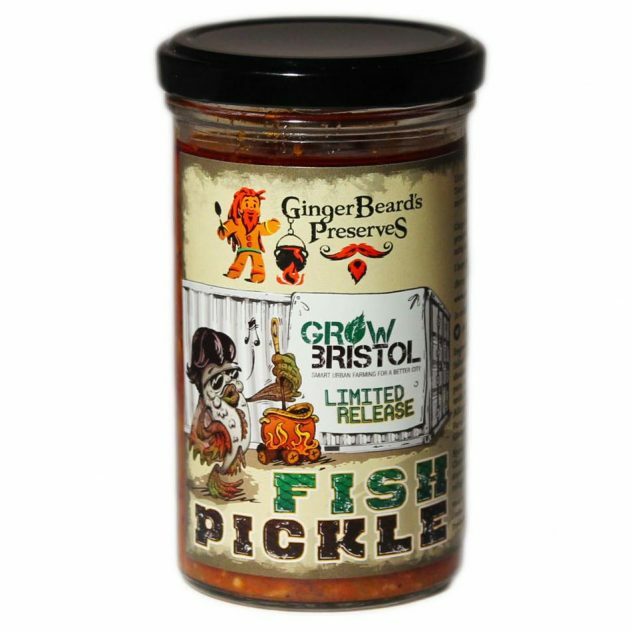 It is a mildly spiced, moreish pickle with chunks of cured fish. Perfect with a curry & poppadoms. Any excuse is a good excuse for a BBQ so from 29 May to 4 June, we are offering 10% off all our sauces and hot sauces in celebration of National BBQ Week. Order your favourite sauces, get down to your local butchers, invite your mates and get that grill going! Follow the link to view all our sauces & hot sauces on offer. Also, get a free GingerBeard’s Preserves tote bag when you spend £20 or more online! We are very pleased to announce that our Pale Ale & Juniper Mustard was awarded Taste of the West Highly Commended this week. Taste of the West are the largest independent regional food group in the UK and are here to promote and support fantastic local food and drink from this region. That’s Cornwall, Devon, Dorset, Gloucestershire, Somerset and Wiltshire. Click here to view the full list of 2017 Taste of the West awards. We got together with the talented folk at the Bristol Spirits Collective to create this beautiful little Bloody Mary Tomato Salsa. 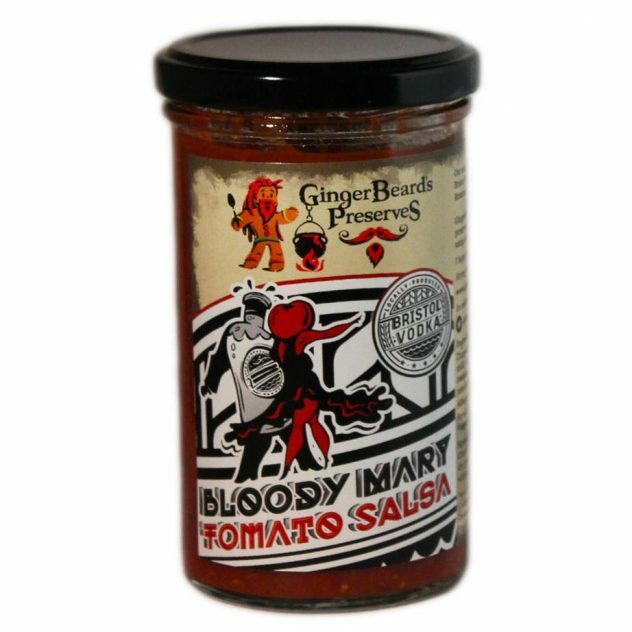 Our salsa packs a nice little punch and taste exactly like a Bloody Mary! It uses Bristol Vodka, produced by the Bristol Spirits Collective in the basement of the Rummer. A perfect dip for tortilla chips or topped on fajitas and tacos. If you get a chance, don’t miss the opportunity to try the Bristol Spirits Collective gins and vodka in a bar near you (or order a bottle from their online shop).